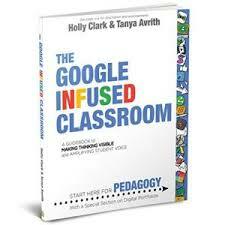 I just finished reading my first book of the summer - The Google Infused Classroom: A guidebook to making thinking visible and amplifying student voice by Holly Clark and Tanya Avrith and LOVED it. I have been teaching for 16 years, and am very involved in the world of EdTech so, while much of the was not new to me, having it all in one place makes me so happy!! This will definitely be one of my go to resources when coaching teachers - and, in my opinion, a must have for all new and aspiring teachers. The book is not really about Google, nor is it about EdTech tools, it is about good pedagogy. It is about engaging students and giving them voice. The book centres around good teaching practice and then outlines how and which EdTech Tools can support. It Addresses All the Things I Am Passionate About in Education. The Google Infused Classroom clearly lays out the importance of rich assessment for/of/as learning, making learning visible, understanding by design, and constructivism. It also introduced me to connectivism (something I believe in but didn't have a name for until this book). All these ideas are explained clearly and succinctly - making it a great resource to introduce or remind. The authors have divided the book into four sections: formative assessment, demonstration of learning, tips for differentiation, and reflect & curation with a bonus section about digital portfolios. I love that you can jump into a section to learn. Moreover, each section outlines why to do it and how it makes thinking visible & amplifies student voice. Once that is clear they introduce an EdTech Tool that can support and outline information about tools including how it works, what it costs, and why it is great. It Is Full Of Great Quotes.The English teacher inside me loves the quotes the authors have included by other authors to drive home the importance of the pedagogy being discussed.